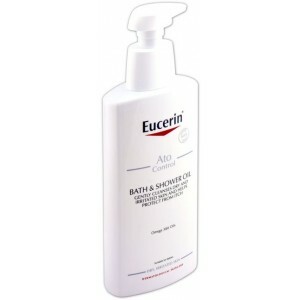 Eucerin is a dermatological skin lotion which is intended to rehydrate dry skin. It can be used by those who suffer from dry skin caused by eczema, xeroderma, hyperkeratosis and ichthyosis. If you place your order before 3pm, our UK regulated pharmacy will dispense and dispatch your treatment the same day, so you could have relief from dry and itchy skin as soon as tomorrow. Eucerin intensive lotion is a moisturiser which contains the active ingredient Urea. It can be used to treat a number of conditions such as eczema, hyperkeratosis and similar condition which cause dry, flaky and itchy skin. Dry skin is characterised by flaky, dry, itchy and discomforting skin. It occurs when more water evaporated from the upper levels of the skin. A number of things can exacerbate your symptoms. The active ingredient of Eucerin, called Urea, is a compound which absorbs and retains water. When Eucerin is applied to the skin, the Urea is absorbed through the outermost layer of skin, known as the stratum corneum, where it draws surrounding moisture and retains it. Additionally, Eucerin provides a protective layer over the skins surface, preventing moisture from escaping and keeping the epidermis hydrated. Eucerin is applied to the skin twice daily. Before you apply Eucerin, make sure your skin is clean and dry. Apply a small amount of the cream either to your hand or the area of dry skin. Massage the cream gently into your skin until all of it has been absorbed. Wash your hands straight after applying he cream. This will prevent you from accidentally getting the cream in your eyes. All medicines carry the risk of side effects, though not everybody experiences them. Knowing the side effects to look out for is important to your care. These mild side effects usually happen at the site of the application and usually do not warrant the need to stop using the product. Don't be afraid of speaking to your doctor about the possible side effects. If you experience any side effects, even if they are mild, you should report them to your doctor as soon as possible. Your doctor may be able to advise you on how to reduce your chances of side effects. If you notice the signs and symptoms of an allergic reaction after applying Eucerin, you should stop using the cream and talk to your doctor immediately. In cases where the reaction is severe, seek immediate medical attention by going to your nearest A&E department. Take the medicine with you so the doctors know how to treat you effectively. When is the best time to use Eucerin? Ideally, you should apply Eucerin after your morning ablutions - following a shower or morning wash.
For an evening application, apply the lotion to your skin and massage it until it is completely absorbed by your skin before going to bed. What should I do if I use too much lotion? If you accidentally apply too much lotion to your skin - after massaging as much of it as you can into your skin - simply wipe away the excess with a tissue and discard it. Using too much Eucerin is unlikely to harm you, however it may increase your chance of side effects. If you are unsure about how much lotion you should be using, speak to your doctor or a pharmacist who will be able to help. Can I use Eucerin while pregnant or breastfeeding? There is no evidence that using Eucerin while pregnant or breastfeeding will harm your baby. However, breastfeeding mothers should express caution while using Eucerin. Do not apply the cream to the breasts before giving a feed, as this can lead to the child accidentally ingesting some medicine.